Mastering the Break is your first task in learning how to shoot pool. Obviously, a game cannot start without the break. And a good break will lead to a good game. So start with that and keep it up if you truly want to learn how to shoot pool well. There are many factors to consider when breaking the rack. Often a different cue is used specifically for breaking. It’s best not to get too anxious and try to be a power breaker from the get go. Start with a basic break until your game progresses. The most important part of your game will be your break, so be sure you are very comfortable with it. Once you find a position and stance that is comfortable and you break the balls effectively, stay with that technique. It can be particularly difficult, when just learning how to shoot pool, to break a racked set of balls. This is a good way to practice and become comfortable with breaking. Start by putting the cue ball on the head spot. (When you get better, you can position the cue ball anywhere next to or behind the head spot to make the break.) After making sure your grip is correct and you have a comfortable stance, aim the cue ball to hit the leading ball of the rack squarely in the front. Do not stop your shot when you make contact with the cue. Follow through with a smooth motion for an extra 6-18 inches. Practicing this now will help you later as you add speed and power to your break. Always try to hit the cue ball as hard as you can without your cue slipping off to one side or off the ball completely. A foul on a break is a very embarrassing way to start. You will find that once you begin to gain confidence in your break, you will shoot harder and perform better breaks. Ideally, a good break is one in which no balls are left touching another ball. The perfect break, when playing eight ball, would be to sink the eight ball off the break shot, thus gaining an immediate win! Though this situation generally doesn’t happen often, it can been achieved and it’s quite a thrill the first time it is accomplished. Don’t expect this when you’re first learning how to shoot pool, though. If it happens, you’ll be too excited to realize what you did right! And, it might just be luck. The break is probably the most important shot of the game. It will set the playing field for all the shots to follow. Spend time on your breaking techniques and styles. Once you are comfortable breaking with the cue on the head spot, move the cue around to different positions. Moving the cue and striking the rack from different angles will have a different effect on the break. 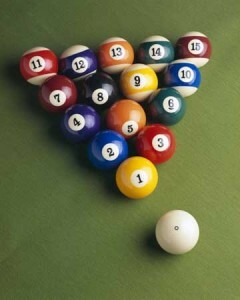 Many players have mastered their break so that they sink at least two balls every time they break. It will take time and patience, but this is a shot you must master if you ever want to become a decent player. Often, players place the cue ball in the same position on the table when breaking. After trial and error and many hours of practice, you will find your own “hot spot” and will have an effective break almost every time. If you’re just starting to learn how to shoot pool, realize you will improve with practice so keep playing!